The ageing workforce and medical cost inflation in Singapore are projected to drive up average medical costs per employee by 108 percent, from S$946 in 2016 to S$1,973 per year in 2030, representing a mounting financial burden for employers, according to a report by Mercer together with Marsh & McLennan Companies’ Asia Pacific Risk Center (APRC). The report included analysis of Mercer’s medical claims database, comprising of 560 companies in Singapore, including small- and medium-sized enterprises and multi-national companies. The report titled “Aging Workforce: Cost and Productivity Challenges of Ill Health in Singapore” added that Singapore employees aged over 50 is projected to increase by 55 percent, and to represent 40 percent of the workforce by 2030. With an increase in demand for medical services, the ageing demographic will contribute to 41 percent of the escalation in medical costs, as it will drive a rise in the utilisation of healthcare services, which together with healthcare cost inflation, will result in a significant surge in overall costs. Neil Narale, Singapore business leader for Mercer Marsh Benefits, said: “With improved management of health conditions permitting individuals to stay in the workforce longer, increasing financial needs in retirement, as well as more flexible employment options, such as working from home, and on-demand jobs in the gig economy, there is a growing trend for Singapore employees to postpone their retirement. “However, health risks increase with age, ranging from diminishing motor and sensory functions to a greater incidence of chronic diseases, which will create challenges for employers,” he added. In Singapore, societal ageing is estimated to drive the prevalence of chronic diseases such as cancer and diabetes by up to 200 percent by 2030, which means Singapore will face the challenges of stagnating productivity growth through increasing rates of absenteeism and presenteeism. 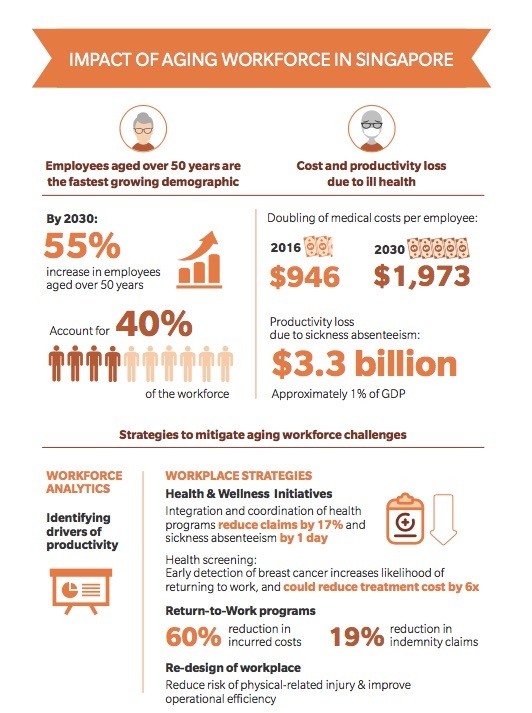 Projected increase in productivity loss due to sickness absenteeism in an ageing workforce. the GNI per capita growth rate. 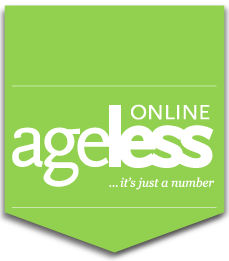 Added Narale: “Organisations need to adapt to current demographic trends by implementing strategies to mitigate the higher costs of ill health and capitalise on the productivity of an older and potentially shrinking workforce. “Consequently, as business leaders and governments design productivity-enhancing changes, it is important for them to consider the implications of an ageing workforce in the development of such strategies. A holistic approach that aims to improve the overall health of the workforce, while pre-emptively introducing initiatives to enhance productivity, will enable organisations to capitalise and maximize the productivity of an ageing and potentially shrinking workforce.” The report suggested schemes such as flexible work arrangements and return-to-work programmes (these help return an injured, disabled or temporarily impaired worker to the workplace as soon as is medically feasible) to retain talent and enhance productivity in light of an ageing workforce.